The planet Mars is becoming shrouded in dust. I mentioned the other day the rover Curiosity seemed to be in pretty good shape as far as dust coverage goes or at least did not have as much dust coverage as I thought it would. The situation for Curiosity may change as a dust storm becomes prevalent both in storm density and duration. The rover Opportunity (indicated with the blue dot in the center of the image) seems to be obscured now and power levels could be impacted, we’ll have to wait and see. Typically the southern summer warms the environment and the dust and sends the particles high into the mostly carbon dioxide atmosphere. As the particles rise in the atmosphere they in turn create more wind and so on, a feedback loop. Exactly how this works is not known – yet. It could be the dust particles absorb enough heat from the Sun to remain boyent or it could be the seasonal variation of methane plays a part; or it could be something completely different and unrelated. Time will tell. The current storm was detected on 01 June 2018 and is still going on and could continue for weeks or months. That seems like a long time but on Mars it happens, maybe not often, but it a well observed phenomenon. The image shown was taken on 06 June 2018 courtesy of Malin Space Science Systems. The map was produced by the Mars Color Imager (MARCI) camera on NASA’s Mars Reconnaissance Orbiter spacecraft, which Malin Space Science Systems produced and operates. As much as I hate to admit this, I know what Pac-Man is. You might say “well who doesn’t know Pac-Man? I remember quite a lot of life BEFORE Pac-Man or those type games. Ha, kind of makes me feel a little old. Beyond that, this is a great image from the HiRISE imager aboard the Mars Reconnaissance Orbiter (MRO). Be sure to click the image and look at some of the details. I like the dunes inside the crater. 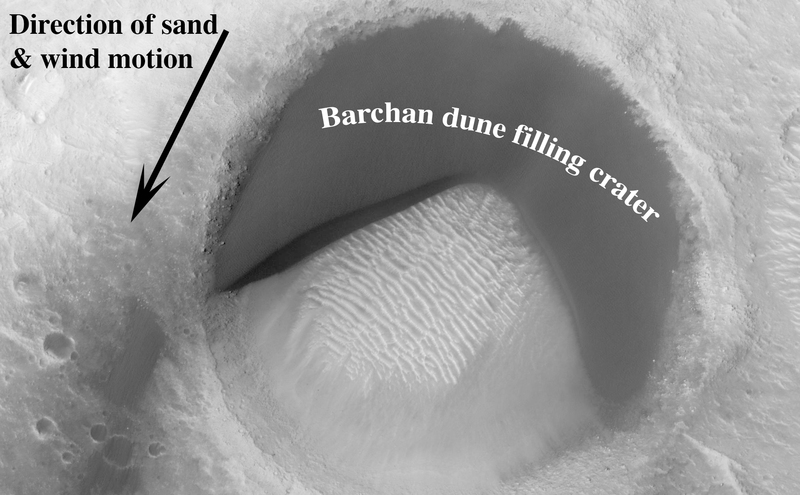 This image from NASA’s Mars Reconnaissance Orbiter shows barchan sand dunes, common on Mars and often forming vast dune fields within very large (tens to hundreds of kilometers) impact basins. The regions upwind of barchans are usually devoid of sandy bedforms, so if you were walking in a downwind direction, then the barchans would seem to appear out of nowhere. But here is something interesting: a barchan dune filling the upwind portion of a small impact crater in a Pac-Man-like shape. This “dune-in-a-crater” is nearly at the highest extent of the field. It is also probably a rare configuration, and over the next few tens of thousands of years the sand will be blown out of the crater. This image from NASA’s Mars Reconnaissance Orbiter (MRO) shows streaks forming on slopes when dust cascades downhill. The dark streak is an area of less dust compared to the brighter and reddish surroundings. What triggers these avalanches is not known, but might be related to sudden warming of the surface. I better let Candy Hansen (NASA/JPL/University of Arizona) explain: On Mars, we often see inverted river channels preserved perched above the surrounding terrain because the sediment inside the river channel was stronger than its surroundings. This is common in the American Southwest in places where lava flowed down river channels and the surrounding sandstone subsequently eroded away leaving ridges in places that started as valleys. There’s another example of high-standing columns protected by a strong cap rock, called “hoodoos.” Looking closer at our image, we see what looks like a crater and its rays of ejecta, preserved and slightly higher than the surrounding terrain, possibly due to a similar process. 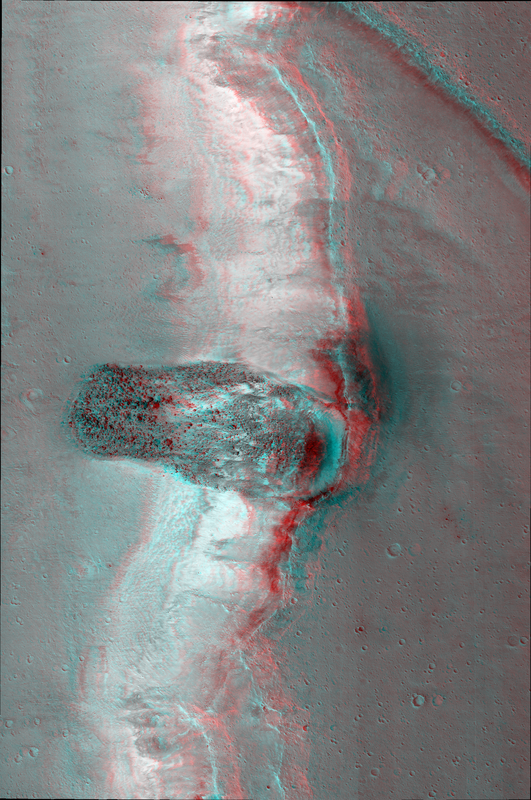 This image NASA’s Mars Reconnaissance Orbiter (MRO) finally completes a stereo pair with another observation acquired in 2007. It shows a fresh (well-preserved) landslide scarp and rocky deposit off the edge of a streamlined mesa in Simud Valles, a giant outflow channel carved by ancient floods. The stereo images can be used to measure the topography, which in turn constrains models for the strength of the mesa’s bedrock. Do look at the stereo anaglyph. This is a stereo pair with PSP_005701_1920. The map is projected here at a scale of 25 centimeters (9.8 inches) per pixel. [The original image scale is 31.5 centimeters (12.4 inches) per pixel (with 1 x 1 binning); objects on the order of 94 centimeters (37 inches) across are resolved.] North is up. Although crater and valley walls offer us roadside-like outcrops from just below the Martian surface, their geometry is not always conducive to orbital views. On the other hand, a crater central peak — a collection of mountainous rocks that have been brought up from depth, but also rotated and jumbled during the cratering process — produce some of the most spectacular views of bedrock from orbit. Thanks to: The University of Arizona, Tucson, operates HiRISE, which was built by Ball Aerospace & Technologies Corp., Boulder, Colo. NASA’s Jet Propulsion Laboratory, a division of Caltech in Pasadena, California, manages the Mars Reconnaissance Orbiter Project for NASA’s Science Mission Directorate, Washington. A beautiful sight and one that could be seen by humans in the not too distant future. This image was taken from the Mars Reconnaissance Orbiter and took a bit of processing, however I suspect at some point in a voyage to Mars the travelers would see this very sight. I wonder if looking back at this from a craft heading to Mars, if second thoughts come to mind. These images were acquired for calibration of HiRISE data, since the spectral reflectance of the Moon’s near side is very well known. When the component images were taken, Mars was about 127 million miles (205 million kilometers) from Earth. A previous HiRISE image of Earth and the moon is online at PIA10244. Edit: the could – well debacle was fixed, tried to get “fancy” – fail lol. And what at first looks something like an image of a herd of animals or something of the like. . .
. . . turns out to be nothing even close. These are the remains of gas pockets below the seasonal ice on Mars. 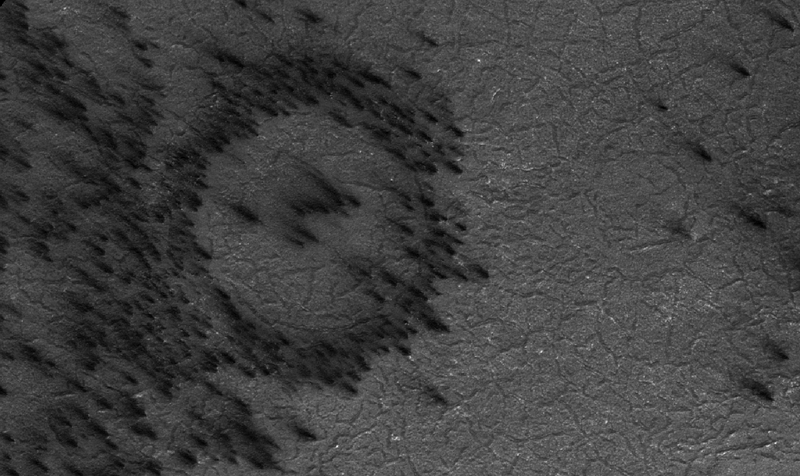 The image comes from the HiRISE imager on the Mars Reconnaissance Orbiter. Gas under pressure will choose an easy escape route. In this image, the terrain is covered with a seasonal layer of dry ice. The weak spots, for gas sublimating from the bottom of the seasonal ice layer to escape, appear to be around craters, where the surface was broken and pulverized by an impact. Fans of surface material deposited on top of the seasonal ice layer show where the escape vents are. Here’s an update from an earlier post. Nice work from the HiRise camera on the Mar Reconnaissance Orbiter. You can see a larger version of the image above by clicking it. There is a larger version yet you can get from NASA which I recommend. 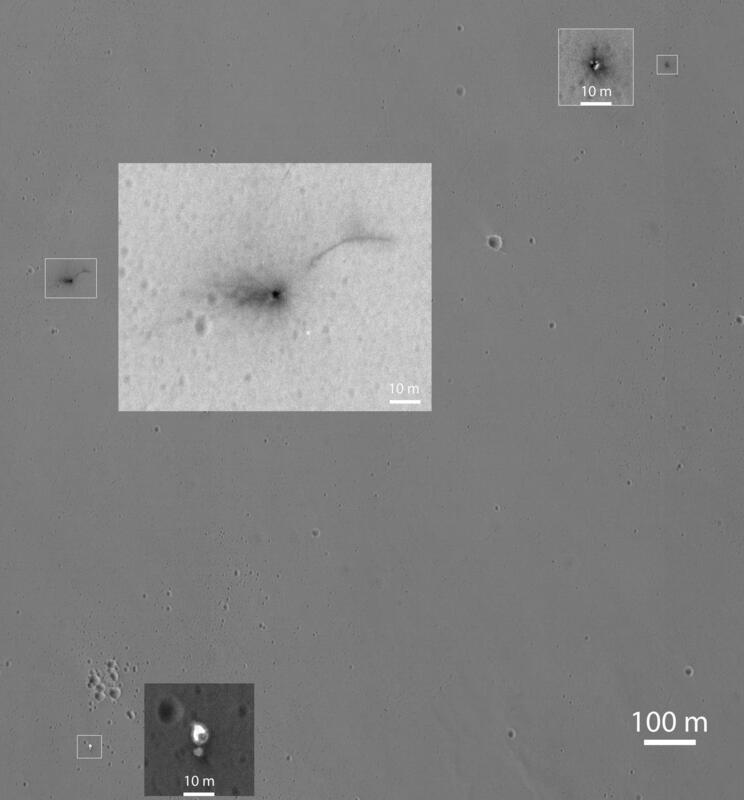 This Oct. 25, 2016, image shows the area where the European Space Agency’s Schiaparelli test lander reached the surface of Mars, with magnified insets of three sites where components of the spacecraft hit the ground. It is the first view of the site from the High Resolution Imaging Science Experiment (HiRISE) camera on NASA’s Mars Reconnaissance Orbiter taken after the Oct. 19, 2016, landing event. The Schiaparelli test lander was one component of ESA’s ExoMars 2016 project, which placed the Trace Gas Orbiter into orbit around Mars on the same arrival date. This HiRISE observation adds information to what was learned from observation of the same area on Oct. 20 by the Mars Reconnaissance Orbiter’s Context Camera (CTX). Of these two cameras, CTX covers more area and HiRISE shows more detail. 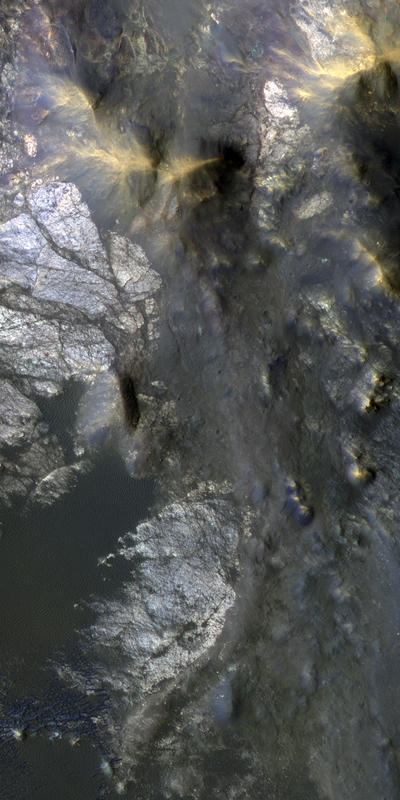 A portion of the HiRISE field of view also provides color information. The impact scene was not within that portion for the Oct. 25 observation, but an observation with different pointing to add color and stereo information is planned. This Oct. 25 observation shows three locations where hardware reached the ground, all within about 0.9 mile (1.5 kilometer) of each other, as expected. The annotated version includes insets with six-fold enlargement of each of those three areas. Brightness is adjusted separately for each inset to best show the details of that part of the scene. North is about 7 degrees counterclockwise from straight up. The scale bars are in meters. At lower left is the parachute, adjacent to the back shell, which was its attachment point on the spacecraft. The parachute is much brighter than the Martian surface in this region. The smaller circular feature just south of the bright parachute is about the same size and shape as the back shell, (diameter of 7.9 feet or 2.4 meters). At upper right are several bright features surrounded by dark radial impact patterns, located about where the heat shield was expected to impact. The bright spots may be part of the heat shield, such as insulation material, or gleaming reflections of the afternoon sunlight. According to the ExoMars project, which received data from the spacecraft during its descent through the atmosphere, the heat shield separated as planned, the parachute deployed as planned but was released (with back shell) prematurely, and the lander hit the ground at a velocity of more than 180 miles per hour (more than 300 kilometers per hour). At mid-upper left are markings left by the lander’s impact. The dark, approximately circular feature is about 7.9 feet (2.4 meters) in diameter, about the size of a shallow crater expected from impact into dry soil of an object with the lander’s mass — about 660 pounds (300 kilograms) — and calculated velocity. The resulting crater is estimated to be about a foot and a half (half a meter) deep. This first HiRISE observation does not show topography indicating the presence of a crater. Stereo information from combining this observation with a future one may provide a way to check. Surrounding the dark spot are dark radial patterns expected from an impact event. The dark curving line to the northeast of the dark spot is unusual for a typical impact event and not yet explained. Surrounding the dark spot are several relatively bright pixels or clusters of pixels. They could be image noise or real features, perhaps fragments of the lander. A later image is expected to confirm whether these spots are image noise or actual surface features. Figure 1 is an unannotated version of the full scene, which covers an area about 0.9 mile (1.5 kilometers) wide. It is a portion of HiRISE observation ESP_048041_1780. The HiRISE imager on the Mars Reconnaissance Orbiter (MRO) took this image of a boulder field on Mars. The boulders are alongside of a canyon probably resulting from a land slide – see the caption below. I spent quite a lot of time looking at the image looking for tracks and was thinking about what would trigger a landslide on Mars. Meteor hit? Seismic activity? The Seismic activity question was to be answered following the NASA’s launch of the InSight spacecraft which was built with a multi-national effort. Insight was to launch in March and was going to look at conditions in the interior of Mars. A technical problem with a seismometer holding vacuum is going to delay the launch for the entirety of 2016. Just to the north of the landslide scarp is a similarly-shaped scar on the cliffside. However, there is no landslide material on the valley floor below it. The older landslide deposit has either been removed or buried, a further indicator of the relative youth of the bouldery landslide. This is a stereo pair with ESP_036886_1760.